The Version 5.9 release of Wild Apricot consists of the following changes and enhancements. Previously, if you wanted to cancel an invoice, you would delete it. However, deleting invoices led to many accounting issues, including incorrect balances and gaps in invoice numbers. Now, you can void an invoice instead of deleting it. Voiding an invoice cancels the invoice without deleting it, thereby preserving historical information for any future audits. To void an invoice, you display the invoice details then click the Void invoice button. You will be prompted to confirm the operation, which cannot be undone. Once you confirm the operation, any settled payments will be removed from the invoice, and corresponding payment will be unsettled. Any event registration or membership application associated with the invoice will not be deleted, but will now appear as unpaid. Notes will be added in both cases indicating that the invoice was voided. On the invoice, the invoice amount will not be changed but the invoice balance will be set to zero. The voided invoice will have a status of voided and will appear marked with a VOIDED stamp. After an invoice is voided, it can be deleted. 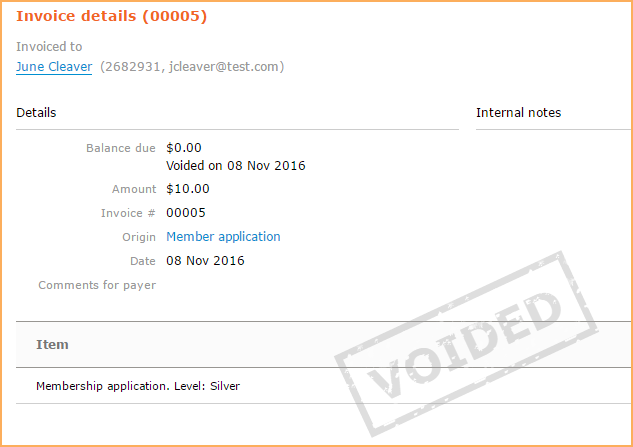 To delete a voided invoice, display the invoice details and click the Delete invoice button. In some cases, the system can automatically void or delete an invoice in response to a registration being cancelled or deleted, or a contact being deleted. 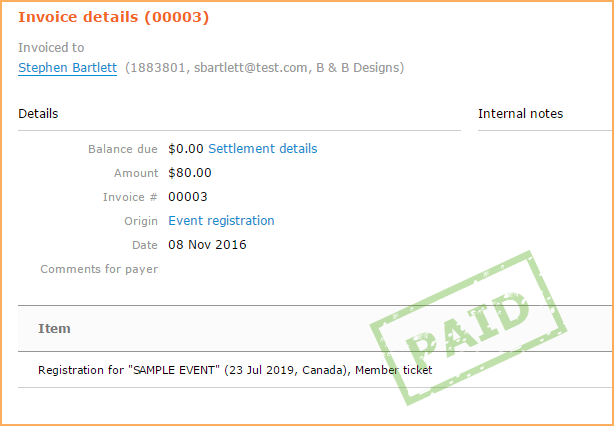 If you cancel an event registration, the corresponding invoice will be automatically voided. Paid invoices are now marked with a PAID stamp to distinguish them from unpaid and voided invoices. The following enhancements have been made to the slideshow gadget. You can now link each image in your slideshow to a separate destination. To link your images, display the slideshow gadget settings and click the Add link to images button. On the dialog that appears, you can choose where each image should link to . You can link to an external website or email address, to a page on your site, or to an event on your site. For each image, you can also specify a tooltip and choose whether you want the linked page to open in a new window or the same window. You can also specify a description which will appear along the bottom of the image. If you are displaying images from a photo album, any captions already assigned to the images will be automatically loaded as default descriptions. You can now display a caption along the bottom of each image within your slideshow. There are two ways you can add captions to images: 1) If you are displaying images from a photo album, any captions already assigned to the images will be automatically displayed along the bottom. 2) While linking your slideshow images, you can enter a Description for each image. If you are displaying images from a photo album, captions will be automatically loaded as default descriptions. An option has been added to randomize the order in which slideshow images are displayed. An option has been added to remove the countdown bar that indicates how much longer each image will be displayed. A number of improvements have been made to the email module. The options for exiting the email wizard are now available from an EXIT menu instead of a X button. Within the email wizard, email templates are now grouped onto different tabs by type. Custom templates that you have created or copied are displayed on the Saved tab. On the Themed tab are professionally designed templates in a variety of colors and styles, with sample content and graphics. 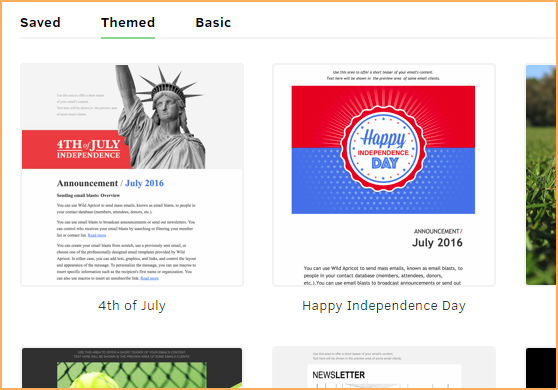 On the Basic tab are simple templates in a variety of layouts, without any sample content or graphics. The older deprecated templates that do not provide the consistency and stability of the newer templates are no longer available for new emails. The Email drafts screen has been redesigned. The Delete button now only appears when you hover over a row. To open a draft of editing, you click the Subject link for that draft. After assigning a background image to a content gadget, layout, page template, or placeholder, you can now exercise more control over how the image appears within the available space. 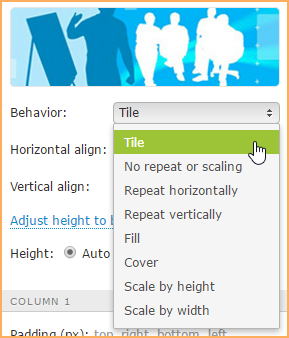 In addition to the options available in the existing Repeat image dropdown – Tile, Repeat horizontally, Repeat vertically, No repeat – the new Behavior dropdown also provides Fill, Cover, Scale by height, and Scale by width options. Fill The image will be stretched to completely fill the available space, and may therefore appear distorted. Cover The image will be proportionally resized to cover the available space, and may therefore be cropped. Scale by height The image will be proportionally resized to fit the height of the available space. Depending on the dimensions of the space, the image may be cropped, or may not fill the entire width of the space. Scale by width The image will be proportionally resized to fit the width of the available space. Depending on the dimensions of the space, the image may be cropped, or may not fill the entire height of the space. A new fully-responsive Building Blocks theme set has been added. This theme set is a variation on the Tinted Tiles theme set, with inverted typography and dark backgrounds. Wild Apricot's API has been significantly expanded, with a number of new calls, and enhancements to a number of existing calls. AuditLogItems – retrieves a filtered list of audit log entries, and retrieves details for a particular audit log entry. EventRegistrationTypes – retrieves the details for an existing event registration type, and creates, updates, and deletes event registration types. The following API calls have been enhanced. Support has been added for Square, a mobile credit card processor. For more information, see Accepting mobile payments using Square.